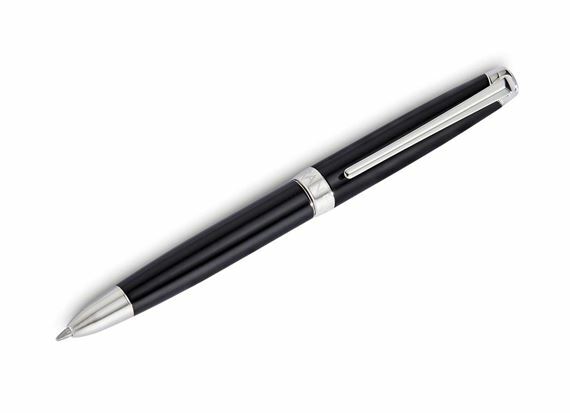 Order your Caran D'ache Leman Bi-Function Ballpoint/Pencil - Black today from FahrneysPens.com. Fine Pens, Refills & Luxurious Gifts – great prices & fast shipping. With the Léman Bi-function, Caran d’Ache has enhanced its Léman collection, showcasing its know-how in the fields of fine writing and graphite. The Bi-function shatters the myth that one has to choose between a ball pen and a mechanical pencil, providing both functions in a single writing instrument. The high-precision rotary mechanism is intuitive and easy to use - just twist the body to activate the ball pen or 0.7mm pencil point. The Bi-function’s contemporary lines, true to the Léman design, ensure optimum handling and outstanding writing comfort. The brass body is layered with polished black lacquer and accented with silver-plated, rhodium-coated trim including the articulated clip with spring mechanism.